The Salt Lake Climbers’ Alliance, in conjunction with the Access Fund, is organizing an Adopt-a-Crag Day on Saturday, October 11 in Little Cottonwood Canyon. This year we’ve gotten permission from the Forest Service to build a new trail leading to the Egg, which will eventually serve to access the Hong Wall and The Coffin (see map). The current disorganized network of social trails is causing undue erosion and impact in this fragile mountain environment. By building this new trail, we hope to mitigate climber impact and provide easy access to these popular crags, which include such classic routes as Lego My Ego, Low Blow, Tick Fever, the Coffin and the Coffin Roof. To make this happen, we really need your help. We need as many volunteers as possible to pitch-in. This is your chance to contribute to your climbing areas and your community. Even if you can only come for a few hours, your help would be greatly appreciated. During lunch break we’ll be raffling off gear and prizes donated by our sponsors, which include Petzl, Liberty Mountain and ProBar (more will be announced later on-stay tuned!). And after a long, fun day of hard work we’ll have an after-party at the Pavilion, located higher in the canyon (special thanks to Jim Williams of Williams Realty for use of the venue). Meet at 8am at the Park-and-Ride at the base of Little Cottonwood Canyon (coffee and a light breakfast will be provided). We’ll carpool up to the work site. Be sure to wear appropriate attire, such as work boots and be prepared for inclement weather. Work gloves are advised. We’ll have tools there, but if you have shovels and other tools, that would be helpful. Learn about what happened and donate if you can. 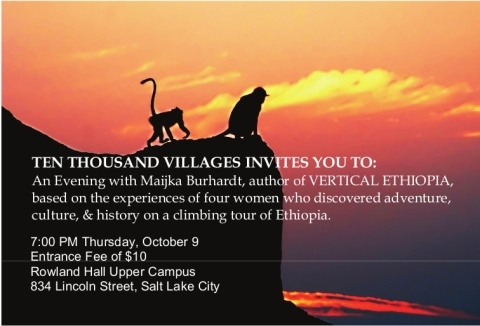 Tickets will be available at Momentum Climbing Gym starting Wednesday, September 10. Tickets will also be available at the Tower on the day of the show. There will be a raffle for great prizes, so come on out and see the show! rafting down the Grand Canyon, making first ascents along the way. Produced by Big UP and Sender Films. featuring scary routes in the UK. walls, and all-or-nothing free solo ascents. This is a little last minute but…come and help clean up this alpine gem. Projects include fire pit dispersal and invasive weed species (thistle) removal. Contact Jonathan Knight at jpknight -A T- juno dot com more information. The third annual Reel Rock Film Tour makes a stop at the Tower Theater. Features the latest releases from filmmakers at Sender Films and Big Up Productions. Films this year include: The Sharp End, Dosage: South Africa, The Aerialist, On Sight and Grand Canyon Walls. Tickets are $10 and can be purchased at Momentum Gym and the Tower Theater. This event usually sells out so get them early…. The 7th Annual HERA Ovarian Cancer Climb4Life hosted by Black Diamond and Exum Utah will take place September 18-21 in SLC. Jason Kehl, Joe Kinder, Katie Brown, Alli Rainey, Noah Bigwood, Kevin Wilkinson, Nate Gold and others will be on hand. A weekend of climbing, parties, yoga and films for a great cause. – Don’t miss Parallel Universes, a multi-media presentation featuring three amazing climbers – Kehl, Kinder and Wirtz. Friday, Sept 19 at 7pm in the SLC Library. Cost is $10 at the door and there will be a raffle for great swag. Free entry for C4L participants. Oct. 11: LCC Crag Clean-up. We’ve got BIG plans in Little Cottonwood and we’re going to need a lot of help! Mark your calendars!!! Oct. 18: Black Diamond Gear Swap. SLCA will be accepting donations of used gear to sell at the Swap. All funds raised will be go to support the SLCA and area projects. Got friends that might be interested in what the SLCA is doing? Forward them this mail and have them contact us to be put on the mailing list. They’ll get updates on access issues, crag clean-ups and other climbing-related events in the area. Check us out on Facebook, too. Interested in getting more involved in protecting and preserving our valley’s great climbing resources? Just contact us…we’re always looking for volunteers…. Time: Tuesday, September 9, 2008, 7:00 p.m. Momentum Video Magazine has shifted to an all-free format. What does that mean to you? Free access to our entire vault of HD climbing videos. MVM offers a complete view of what’s happening in climbing – right now. With a new RSS feed and daily updates from the likes of Joe Kinder, Sonnie Trotter and Jamie Emerson, MVM offers news, entertainment and video footage, not to mention dailies and outtakes from Mike Call’s latest films. Momentum Video Magazine – www.momentumvm.com– is now free. Welcome to climbing media reloaded. Check it out. Let me know what you think. And – if you’re not already – GET INVOLVED! You are currently browsing the Utahclimbers.com blog archives for September, 2008.